If you're looking for some authentic Indian flavours you need to head to Agra in Myeongdong, Seoul. This delightful ghetto styled restaurant currently has an amazing lunch special for W9800. This includes a green salad (don't let is name fool you into thinking its boring and plain), a choice of curry and rice, naan bread and a coffee/lassi to end things off with. When not eating something off their 'special lunch menu' the meals are pretty pricey and the portions aren't very big. Definitely worth a stop for their lunch special. 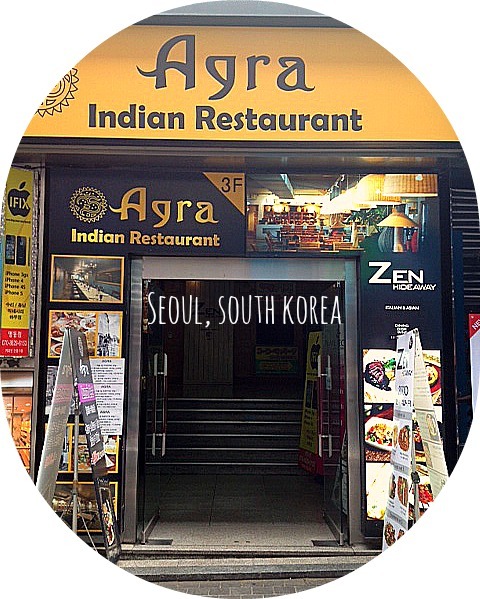 There are a few branches of Agra in Seoul (one in Itaweon above the Burger King and another somehwere else). We went to the one in Myeongdong, on the third floor just behind VIPS. Walk out of Myeongdong Subway stop, exit 5/6/7/8 and head down the busy road with the giant Uniqlo. Turn left at Dunkin Donuts, then turn left again after 5 minutes at the VIPS. Its a little way up that street on the 3rd floor. Have you eaten there before? What did you think? Any other recommendations for Indian restaurants in Seoul?